The Horatio chair by Duresta is handmade in Britain combining traditional manufacturing skills with top-quality materials for long lasting, sumptuous comfort. Elegantly styled in a classic design, it boasts beautiful proportions with slightly curved arms and elegant patterned fabric to add a vintage feel to the modern day home. The frame is made from selected hardwoods that have been dowelled, glued and screwed for durability, with coil sprung seating and serpentine sprung back for comfort. With an extensive selection of luxurious fabrics in varying patterns and colours, the Hornblower sofa is sure to enhance the style of your living room. The legs are available in a range of colours, with or without castors according to your preference. 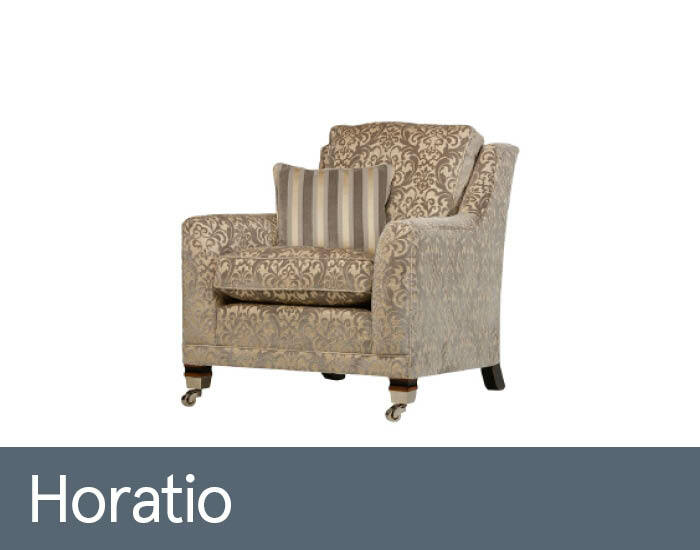 The Horatio chair goes perfectly with the Horatio footstool and Hornblower or Trafalgar sofa to complete the look.